So... what can I say? 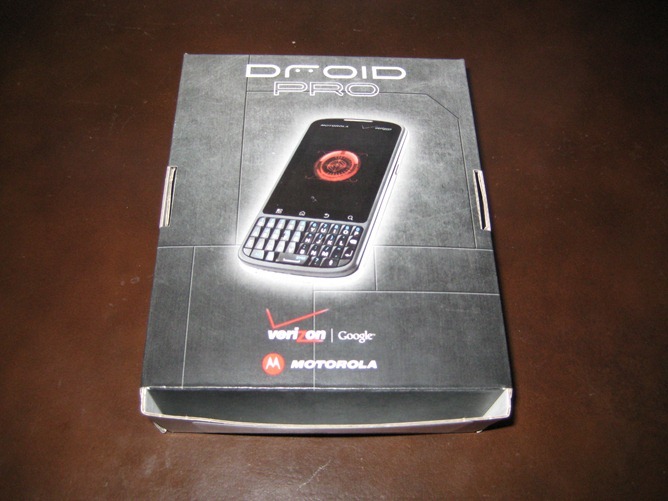 It's the Droid Pro, Android's answer to the Blackberry, the Blackberry running Android - in short, the phone that's supposed to kill off RIM once and for all. But is it? Our review unit just arrived in the mail today, and while I'm not ready to do a full review just yet, I am ready to give you my initial impressions as well as an overview of what's in the box. Ready? Read on! I won't lie: I was expecting more than this, at least on the design front. While the front of the Droid Pro looks a lot like the series of phones it hopes to replace (that would be the Blackberry), the disaster begins with the battery cover, which is made of material akin to that of the Samsung Fascinate, a phone infamous for feeling cheap and plasticky. 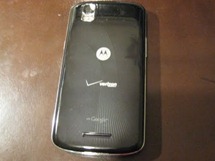 Worse still, Motorola's included curvy lines on the back that make it seem really low-end. 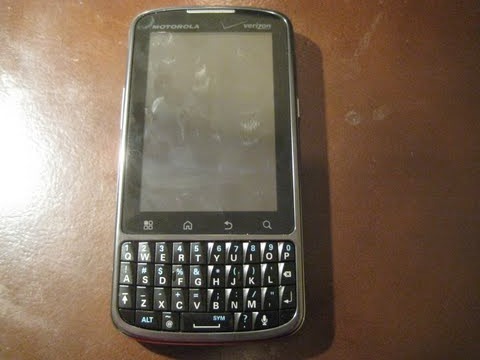 As I mentioned, the front is very similar to that of a Blackberry, which is just fine in my book seeing as the device is aimed primarily at enterprise customers. The design's highest point is, without a doubt, the sides. They are wrapped in a silver band, much like the iPhone 4 (except the Droid Pro's band doesn't serve an antenna-related purpose - probably a good thing). 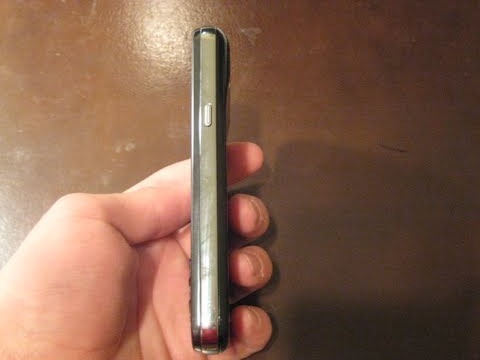 Moreover, the phone is also pretty thin - not the slimmest handset currently on the market, but definitely not the bulkiest, either. Overall, the Droid Pro's design is a mixed bag. 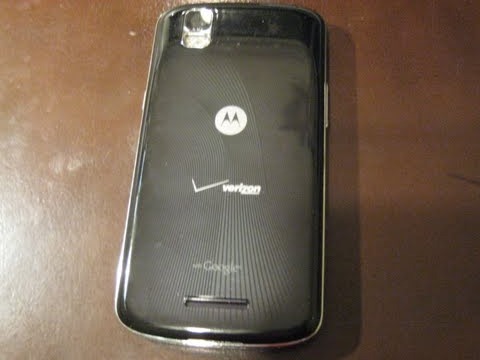 While I can see professional customers digging its mug and its sides (and I do too, kind of), the back is almost unforgivable, especially since the Droid X's camera hump has carried over to the Pro. So what about the 1GHz processor contained inside? I haven't conducted formal speed tests just yet, but here's what I can tell you so far: the thing flies. I'm finding its performance to be about on par with my EVO 4G, which itself is incredibly speedy (unsurprising, given both phones run at 1GHz). Enterprise customers are going to love it for its speed alone. Ah yes, and the phone does have both a GSM and a CDMA radio, which means that unlike most other Verizon devices, you'll be able to use it overseas. Out of the box, Big Red gives you a SIM card designed for use on its own network (obviously), as well as Vodafone for global usage. We'll have to wait and see if unlockers get it up and running on AT&T. I can't really attest to the other aspects of the hardware such as the battery, the keyboard, and the camera since I haven't really spent enough time with the phone yet, but I will say that the battery died on me just about four or so hours after the phone was taken out of the box. This was with decidedly moderate usage - all I did was set up my email, catch up on Android Police, and play a quick game of Angry Birds. It's important to note, however, that although the phone appeared to be fully charged when I took it out of its box, this may have not been the case, thus explaining the quick drainage. I hope. 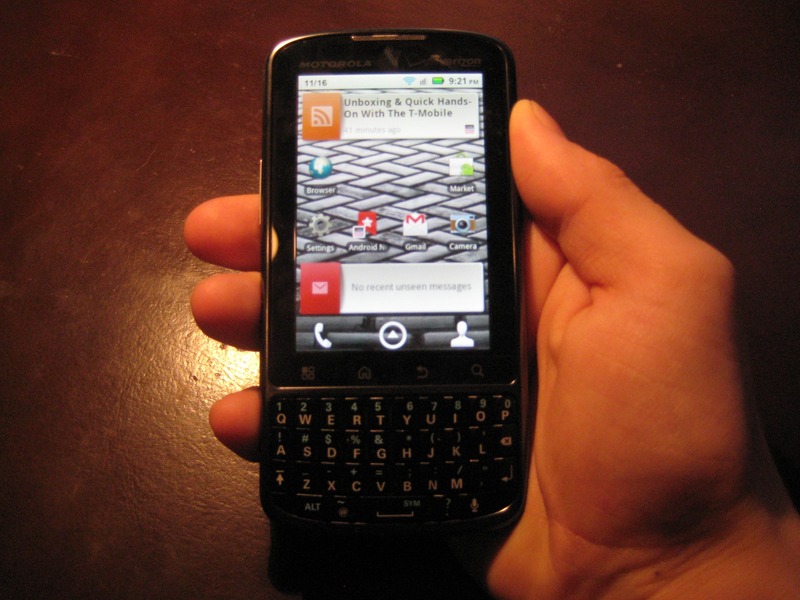 The software side of the phone is much less interesting than its hardware - it's running Android 2.2 Froyo underneath the same skin featured on the Droid 2 and the Droid X. It's not nearly as intrusive as the version of Motoblur found on devices like the Backflip and the Charm, but it's still laggy, crashy, and full of embarrassing mistakes (i.e. "DLNA stopped working due to WiFi lost"). Additionally, I had a browser crash, and I'm 99% sure the skin was to blame, especially since I wasn't even visiting a site with Flash content. I must say, however, that I was pleasantly surprised to see just how well Android scaled to the smaller display of the Droid Pro. I never once thought that I would like to have more screen real estate, despite the fact that the Pro only has 3.1 inches of it. Either Motorola's done something really nice with the bezel surrounding the display (you know, to make the screen seem larger than it actually is), or our beloved OS just scales really well to screens of different sizes. Either way, I think users will be quite pleased with the Pro's screen. I'm still making up my mind about lot of things about the Droid Pro - I've only had it for a few hours, after all - but from what I've seen thus far, it's a great little phone, especially if you're an enterprise customer looking for a decent Android option on Verizon. 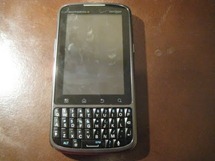 Its design could use some work, but if its speed, screen, and GSM/CDMA radio are any indication, it's pretty phenomenal. Major 6-Hour Google Market Maintenance Coming This Thursday. What Could It Be For?